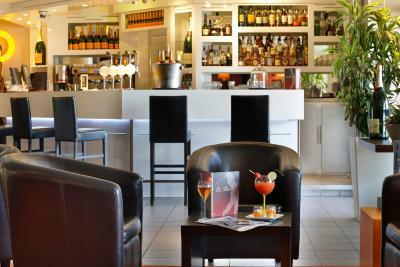 Lock in a great price for Hotel The Originals du Golf de l'Ailette Laon Sud (ex Qualys-Hotel) – rated 8.7 by recent guests! Lovely pool and great view over the lake. Excellent waiter service on terrace and good food in restaurant. Location. A superb start to a weeks road trip. Relaxing and beside a stunning lake. Free use of bikes. Lovely pool. A very relaxing place. This hotel was absolutely perfect. Would love to have had time to stay here a couple of days. 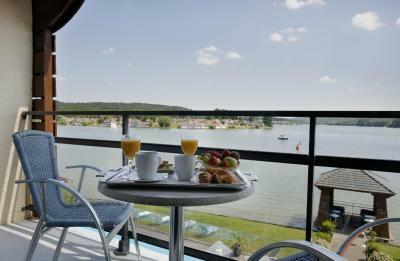 The food was excellent and our rooms had balconies looking st a gorgeous lake. Very friendly and easygoing staff. The stay was fluid. Fantastic location by the lakeside. Hotel has an outdoor pool directly in front of the hotel. 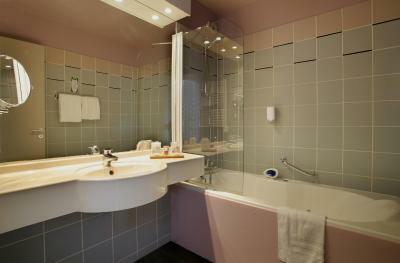 Great spacious bedrooms were very clean with a modern spacious bathroom. Food excellent in the restaurant and the staff were very pleasant. Good quite location with plenty of parking, nice views across the lake and a decent restaurant. The rooms a pretty well furnished in modern style. 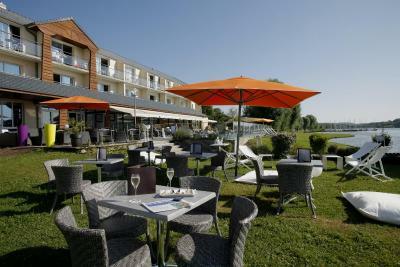 A modern, well-equipped hotel set on a lake and adjacent to a golf course. 30 minutes from Reims, about 10 to the motorway at Laon, the situation is attractive and, at least when I was there, peaceful. I've never been in high season, the lake offers many activities as the weather permits, and it may be less calm then, but it's also a major selling point, as are the golf course, and the in-house spa facilities and swimming pool. Good-sized rooms, even the simplest of them, most lakeside, with private balconies. 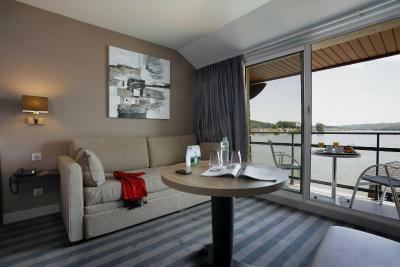 Located on the banks of the Ailette River, Hotel The Originals du Golf de l'Ailette Laon Sud (ex Qualys-Hotel) offers panoramic views of the lake and modern rooms with a private balcony. A heated, outdoor swimming pool is offered as well as a massage room. 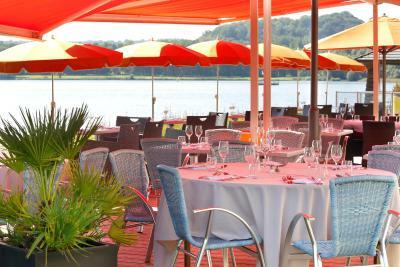 Experience truly comfortable accommodations and sample delicious cuisine at the Hotel The Originals du Golf de l'Ailette Laon Sud, located in an exceptional green setting on the bank of a lake. Breakfast is served everyday at an extra cost. Guests have access to the Aqua Mundo water park, located 1.2 mi away, upon reservation. The Ailette Golf Course is only 1,950 feet from the property and walking paths border the lake. Free bikes are available on site. Free private parking is provided at Hotel The Originals du Golf de l'Ailette Laon Sud, making it easy to explore the Picardie region by car. The hotel is near a golf resort and a sailing school, and close to famous historical sites including Laon and its gothic cathedral. This property also has one of the top-rated locations in Chamouille! Guests are happier about it compared to other properties in the area. This property is also rated for the best value in Chamouille! Guests are getting more for their money when compared to other properties in this city. 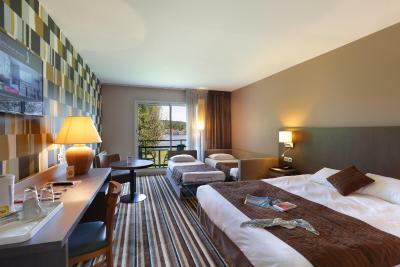 When would you like to stay at Hotel The Originals du Golf de l'Ailette Laon Sud (ex Qualys-Hotel)? With a terrace or balcony, this room features a flat-screen TV with satellite channels, a safety deposit box, a mini-bar and an electric kettle. The private bathroom includes a hairdryer and free toiletries. With a lake view, this air-conditioned room has an LCD TV with satellite channels, safe, mini-bar and tea and coffee making facilities. The private bathroom has an hairdryer, towels heater and separate toilet. This family room features a balcony and lake view. An electric kettle, mini-bar and flat-screen TV are also provided. 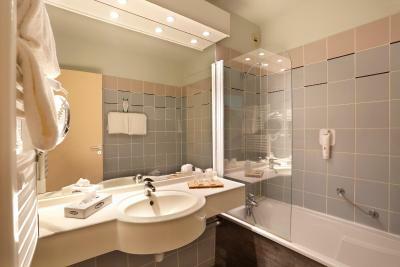 A private bathroom has an hairdryer, towels heater and separate toilet. House Rules Hotel The Originals du Golf de l'Ailette Laon Sud (ex Qualys-Hotel) takes special requests – add in the next step! Hotel The Originals du Golf de l&#39;Ailette Laon Sud (ex Qualys-Hotel) accepts these cards and reserves the right to temporarily hold an amount prior to arrival. Hotel The Originals du Golf de l'Ailette Laon Sud (ex Qualys-Hotel) accepts these cards and reserves the right to temporarily hold an amount prior to arrival. Please note that the heated swimming pool is available from May to September. Breakfast is available daily at the property at an extra fee of EUR 15 per person. Restaurant is a little expensive, only one lift and it's just a bit to far from the motorways to make it ideal as an overnight stop on the way south/north. No negative remarks in particular. After requesting fresh milk in the room on arrival I was disappointed it had been overlooked. The tea bag selection was very poor and not in plentiful supply with in room facilities. Great value for money hotel. The staff were friendly and the food was fine. Rooms were great and there was plenty of safe parking. Have used this hotel now on numerous occasions. Room smelt slightly of smoke. Great view over lake, beautiful sunrise in morning. Good restaurant but expensive. Plenty of parking. Very comfortable beds. Electric car charging in car park. Nothing really, maybe the bar prices were a bit high. Lovely modern hotel with helpful staff. Our room had a wonderful view over the lake. We have stayed here before and the ground floor rooms are perfect if you are travelling with a pet - you can open the door directly into the grounds (incidentally booking.com says pets are not allowed, which is untrue although there is a charge). Very good breakfast and the evening meal was good too. Wonderful location. Large, stylish room overlooking garden & Lake. Excellent friendly yet totally professional staff. I didn't want to leave & DO want to return. Very expensive food and drinks. The staff and service were extremely poor. Staff were so so rude at this hotel - we couldn't believe it. We arrived fairly late after a long drive from the Alps with the children who were all really hungry. We were told we weren't allowed to eat in the bar and would have to order food to our room, but we didn't really want to eat in the room as it was pretty small and not that nice to eat in . The gentleman at the restaurant was extremely rude, he basically dismissed us and made out like we weren't really welcome in the restaurant. The hotel is a bit tired and definitely in need of a huge refurbishment too - you feel like you have entered a French time warp both in terms of service and decor! Ww won't be going back I am afraid, despite it being a handy stop off on the way back to Calais. Taps really hard to turn on in the bath so couldn’t get cold water on and couldn’t have a bath. Also instructions to use jacuzzi only in French do couldn't use.